Walt Stischer was born in 1930 in San Antonio, Texas. 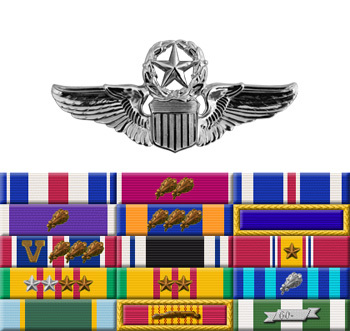 He was commissioned a 2d Lt in the U.S. Air Force through the Air Force ROTC program on May 29, 1954, and went on active duty beginning July 8, 1954. Lt Stischer next completed pilot training and was awarded his pilot wings at Laredo AFB, Texas, in September 1955, and then served as a KB-29 Superfortress pilot with the 506th Air Refueling Squadron at Bergstrom AFB, Texas, from October 1955 to June 1957. His next assignment was as a KB-29 pilot and then as a KC-135 Stratotanker pilot with the 92nd Air Refueling Squadron at Bergstrom AFB and then Fairchild AFB, Washington, from July 1957 to February 1964, followed by service as a KC-135 pilot with the 70th Air Refueling Squadron at Little Rock AFB, Arkansas, from February 1964 to August 1966. During this time, Capt Stischer flew combat missions in Southeast Asia from March to April 1965. After completing Air Command and Staff College at Maxwell AFB, Alabama, and RF-4C Phantom II Combat Crew Training at Bergstrom AFB, Maj Stischer served as an RF-4C pilot with the 12th Tactical Reconnaissance Squadron at Tan Son Nhut AB, South Vietnam, from December 1967 until he was forced to eject over Laos and was taken as a Prisoner of War on April 13, 1968. After spending 1,811 days in captivity, Col Stischer was released during Operation Homecoming on March 28, 1973. He was briefly hospitalized to recover from his injuries at Lackland AFB, Texas, and then served as Director of Operations for the 67th Tactical Reconnaissance Wing at Bergstrom AFB. Col Stischer retired from the Air Force at Bergstrom AFB on February 1, 1981. 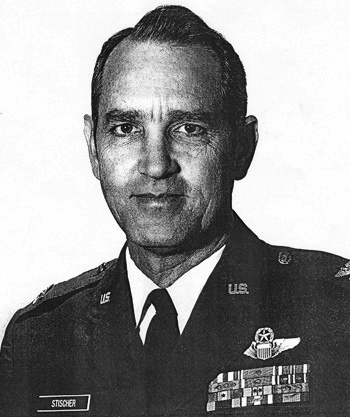 Major Walter M. Stischer distinguished himself by gallantry in connection with military operations against an opposing armed force in Southeast Asia on 7 April 1968. On that date, Major Stischer flew an unarmed and unescorted reconnaissance mission into unfriendly territory to obtain visual and photographic data on a heavily defended surface to air missile site and an airfield. Hampered by poor weather conditions, he penetrated extremely accurate and intense ground fire, completely disregarding his own safety, in order to obtain complete photo coverage of the assigned targets. As a result of Major Stischer's valiant efforts, invaluable data concerning the activities of hostile forces was provided to the forces allied to the Republic of Vietnam. This information greatly facilitated allied efforts in this area. By his gallantry and devotion to duty, Major Stischer has reflected great credit upon himself and the United States Air Force.